In case some of you aren’t aware, geekdom has it’s share of fan… interests. One such interest is the act of “shipping,” which basically boils down to someone becoming obsessed with a certain couple on a show (whether or not the couple has actually come to fruition or not). Now with the Chuck fandom, there’s a very marked interest. The fans, finding out that the show was on the chopping block, decided to do everything possible to keep it on the air. Remarkably enough, they were totally successful, which is great, because the show has been awesome this season. However, since the fans are so involved, some of them have taken on a disproportionate ownership to the show and feel as though they are entitled to determine the way the story line arcs. This is… well, ridiculous. I’ll discuss last week’s episode and this weird phenomenon after the jump! The big thing with last week’s episode was that Hannah, Kristen Kreuk, almost died in a Ring heist and Chuck saved her and she was grateful. So they totes hooked up. The other big thing from the episode was that Shaw was majorly flirting with Sarah and she was all, “Pshaw!” (see what I did there?) and then she was like, “Nyah, j/k, you’re totally hot.” And then they hooked up. And then there was the whole silliness with people almost dying because they were constantly running out of oxygen/ being poisoned. And that’s pretty much exactly what happened. Now, for any normal viewer of television, a story arc where the main couple (in this case, Chuck and Sarah), drift apart in a believable and well-written way is only natural. It provides conflict and plot and drama and the cute “will they/won’t they” stuff that makes a show… pop. It’s normal. Show’s need a story! If everything is happy and hunky dory, nothing is interesting and the show flops. Because of the evolution of the characters, it makes complete sense as to where their hearts (or at least, their pants) are leading them. 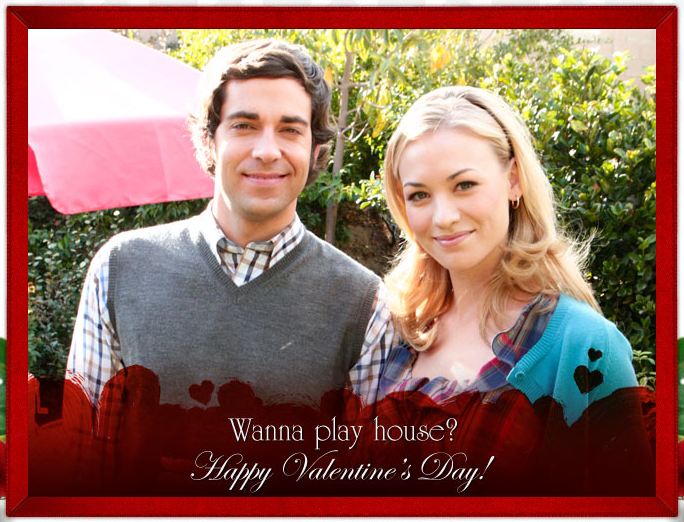 In fact, as much as I adore Chuck and Sarah together (they’re sweet and funny and have some of the best chemistry on TV, right now, seriously, if you still haven’t checked out the show, do so to just watch Zac and Yvonne be adorable together), I’ve liked watching Chuck and Hannah (Shaw and Sarah… maybe not so much, his flirting was a little more creepy than charming. Seriously, dude, a neck kiss? Ehh, but they are growing on me) they’re a great couple and they match up well. So, yea, to all of the Chuck/Sarah shippers (Chara shippers? ): relax. The couple will get back together (maybe) if it makes sense for the story. Stop threatening to boycott the show and enjoy what’s happening with the plot. Seriously, if you can’t enjoy the writing and the journey the characters are on, you need to not freak out. You need to remember it’s a show and the writers are paid professionals, they have it covered. So just relax, weirdos, it’s not like they’re breaking up Han and Leia. « Great scott, this is getting heavy.